Is Sony's baby Xperia one L of a good phone, or one L of a letdown? The days of Sony Ericsson are long gone, with Sony pushing its own smartphone brand to the fore, aided by the excellent Xperia Z. In a smartphone market that is becoming ever more populated, the Sony Xperia L sits towards the bottom, looking up at the aforementioned Xperia Z, Xperia Z1, and the Xperia SP. Sitting on contract prices seen on Vodafone at around £20pm, and with a £229 (around $250, AU$270) SIM free price tag, the Xperia L is left to fight it out price wise against the ageing Samsung Galaxy S3, the newer Nokia Lumia 620 and even the powerful Huawei Ascend P6. It will also have to prove it has the means to overcome the ZTE Blade V, Huawei Ascend Y300 and Nokia Lumia 520, handsets that have already established themselves at the base end. Oh, and lets not forget about the excellent Moto G.
Sony want to sell the Xperia L based on its camera technology, the 8MP Exmor RS sensor on the back, with Sony claiming that if camera engineers made a smartphone, it would be the Xperia L. We will be looking at that later on. However, Sony does realise that there is more to a phone, even a camera phone, than just the camera. 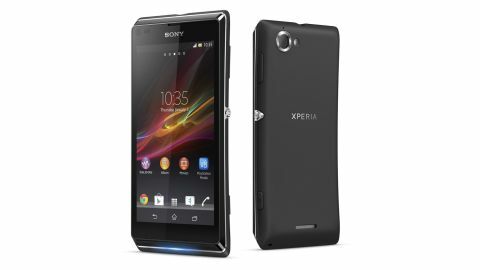 Sat within a curved chassis, a design wholly pinched from the Sony Xperia J and Xperia T, is a dual-core 1GHz Qualcomm chip, running a skinned version of Android 4.1 Jelly Bean. These specifications sound a little 2012 if we're honest, which is disappointing given that the Xperia L looks and acts like it's from 2013. The 4.3-inch screen on the front is bright and crisp, but lacks the Bravia engine that was seen on the Xperia SP and Xperia Z1, we assume as a cost-cutting measure. Measuring in at 128.7 x 65 x 9.7mm, the Xperia L is by no means a large phone. At 137g, it isn't exactly a light phone though, although we found that the added weight gave the Xperia L a more premium feel. There are three colour options available, with our review model coming in black. The standard white option is also available, with the third being black with a fancy looking red rear cover. A thin metallic band wraps around the Xperia L, breaking up the block colour nicely, and doubling up as a means of notifications, as a coloured light emanates from the centre of the base. Looking at the front of the Xperia L, Sony has again chosen to omit what may be considered the three standard Android keys, especially if you are familiar with any of Samsung's devices. It opts instead to rely upon the on-screen buttons we saw on the Nexus 4. This leaves the front of the Xperia L with little else other than that 4.3-inch, 854x480 screen. Sony must be trying to sell the Xperia L on the capabilities of the rear camera, as the front-facing sensor is only at VGA resolution, sat in the top of the bezel. We appreciate that Sony might have been going for symmetry, but with the lack of any front-facing buttons, and the curved chassis, the bezel feels a little chunky. For external buttons, the Xperia L has a round lock/power key sat about half way up the left side, sat below the volume rocker. Due to the Xperia's size, both are exceptionally easy to hit accidentally. Also situated on the left side is a dedicated shutter key, used to take photos and quick boot into camera mode from sleep mode. Because the button has two levels when you press it, one to focus and harder to shoot whilst the camera is open, we found that we never pressed the button hard enough to load the camera app quickly. Ports wise, the Xperia has both the standard 3.5mm headphone jack and a microUSB port. Our colleague Kate will be pleased to find that the headphone port is at the top of the Xperia L, sat neatly in the centre. The micro USB port sits about a fifth of the way down the right. The curved design does help the back plate sit tight against the rest of the Xperia L. Housed behind is a 1700mAh battery, that hides away a microSD slot, so there is no hot-swapping there. The Xperia L also takes a standard SIM card. Overall the Xperia L is a nice looking handset, although immediately feels outdated as it is nigh on identical to its predecessors, the Xperia J and Xperia T. It also has a hell of a fight on its hands against a burning budget smartphone market, one that is hotter than ever with ageing flagships providing a lot of competition to newer tech.